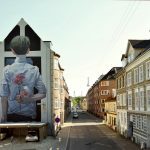 Under the motto “One Wall – One Message”, internationally recognised and aspiring artists design the facades of a building in public spaces in Berlin. “One Wall” was initiated by the Urban Nation Museum, under the artistic direction of museum director Yasha Young. Yasha Young invited Belgo-American street artist and filmmaker Nils Westergard to Berlin, where they developed a new “One Wall” concept together with the assistance from the “Faces of Auschwitz” project. Nils Westergard was invited to paint “The Unforgotten” on the building at Bülowstrasse 94, and follows a very special central idea: it is a memorial wall for the victims of the Nazi regime, who were persecuted, kidnapped, imprisoned and murdered for being homosexual. Homosexual acts between men were considered a crime during the Nazi period in accordance with §175 of the criminal code because it was a “threat to the morals and purity of the German race”. Those convicted were marginalised as “asocial parasites” and labelled with a pink triangle. Nils Westergard’s memorial wall portrait shows the Auschwitz detainee Walter Degen in his concentration camp prisoner’s uniform and with his prisoner number 20285, as well as the pink triangle on his left breast. Walter Degen, a former locksmith, was deported as a German political prisoner at the age of 32 for being homosexual, and was registered at the Auschwitz concentration camp on 29 August 1941. In May 1942, Walter Degen was transferred to the Mauthausen concentration camp. It is not known if he survived or not. Nils Westergard mural is a delayed collaboration with artist Mademoiselle Maurice, who initially laid down the foundations for this memorial wall with over 200 metal origami birds, which formed a triangle in the centre, during the summer of 2017. Nils Westergard memorial wall can be found in the LGBTQI friendly neighbourhood of Berlin-Schöneberg. The memorial wall will continually transform over time with different international artists in the future. The link between art and political action in the public sphere, also known as “artivism”, captures this historically relevant theme in order to create a collective memory. So far the “One Walls” project in Berlin has seen twenty-seven murals by world recognised artists like Onur & Wes21 (Switzerland), Don John (Denmark), Shepard Fairey (USA), HERAKUT (Germany), Phlegm (Great Britain), Li Hill (Canada) and Pixel Pancho (Italy), just to name a few.